I’m currently building an induction heater. I’ve already built one controller based on an analog PLL so this time I decided to go all digital and use an ARM Cortex-M4 microcontroller (STM32F303). For this I needed to implement a digital phase-locked loop running on the MCU. An ADPLL is basically an analog phase-locked loop but implemented in software. You take the phase difference between a reference signal (the one you are trying to lock to) and your output signal with a phase-frequency detector and feed that difference to a filter that calculates a value that you then use to adjust your oscillator and try to match the frequency and phase of the reference signal. 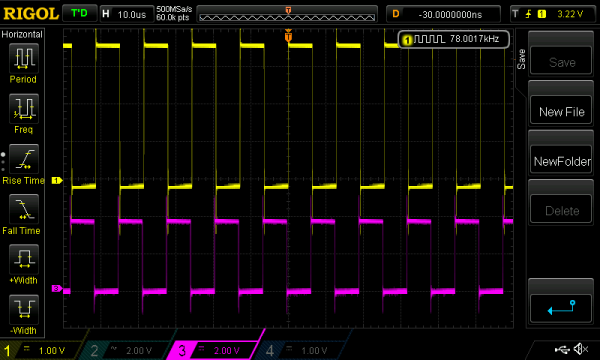 In an ADPLL even the oscillator is digital. In my version I’m using the STM32 integrated PWM module. This entry was posted on Wednesday, August 13th, 2014 at 1:14 pm	and is filed under ARM. You can follow any responses to this entry through the RSS 2.0 feed. You can skip to the end and leave a response. Pinging is currently not allowed. SANSHO was founded in Tianjin, China, in 1916. As almost 100 years have passed since the foundation, the dynamism of SANSHO which was expanded to all over the world through the export of Chinese products is now succeeded by us as 13 overseas affiliates in 8 different countries. From now onward, we aim further growth by increasing the sale of eco-friendly products and challenging some new business beyond our outstanding business framework. We continue to value the trust by our customers and the challenge for something new.